The region which run along the coast of the Adriatic Sea and extended inland on the Dinaric Alps was called Illyria by the Greeks. Originally the Romans also called it Illyria. Later they called it Illyricum. The Romans fought three Illyrian Wars (229 BC, 219/8 BC and 168 BC) mainly against the kingdom of the Ardiaei in the south of the region. In 168 BC they abolished this kingdom, divided it into three republics. The area became a Roman protectorate. The central and northern area of the region engaged in piracy and raided north-eastern Italy. In response to this, Octavian (who later became the emperor Augustus) conducted a series of campaigns in Illyricum (35-33 BC). The area became the Roman province of Illyricum probably in 27 BC. It was a senatorial provinces. Due to troubles in the northern part of the region in 16-10 BC, it became an imperial province. The administrative organisation of Illyricum was carried out late in the reign of Augustus (27 BC-14 AD) and early in the reign of Tiberius (14- 37 AD). Due to Octavian having subdued the more inland region of Pannonia (along the mid-course of the River Danube), the Romans changed the name of the coastal area to Dalmatia. 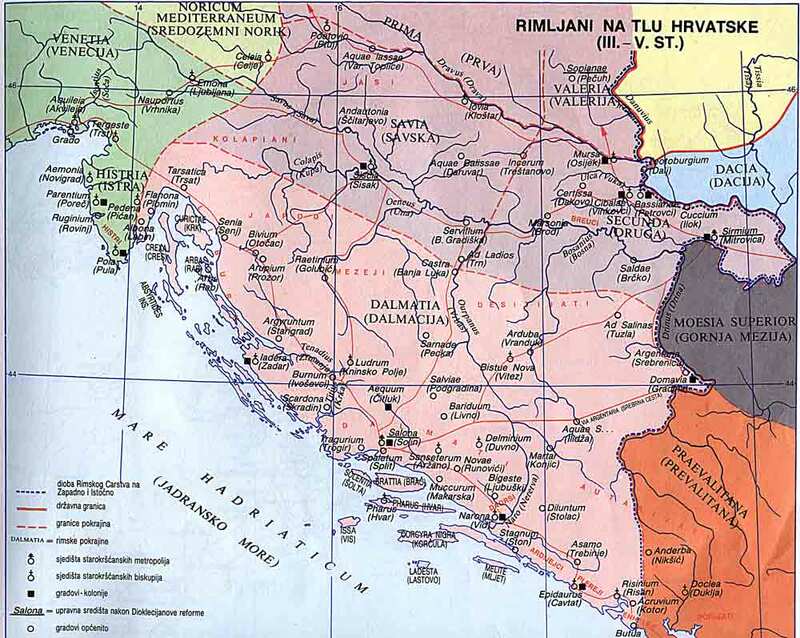 Illyricum was composed of Dalmatia and Pannonia. The earliest writing which indicates that the province of Illyricum comprised Dalmatia and Pannonia is the mention by Velleius Paterculus of Gaius Vibius Postumus as the military commander of Dalmatia under Germanicus in 9 AD, towards the end of the Batonian War. In 6-9 AD there was a large scale rebellion in the province of Illyricum, the Bellum Batonianum (Batonian War). The province of Illyricum was eventually dissolved and replaced by two smaller provinces: Dalmatia (the southern area) and Pannonia (the northern and Danubian area). It is unclear when this happened. Kovác noted that an inscription on the base of a statue of Nero erected between 54 and 68 AD attests that it was erected by the veteran of a legion stationed in Pannonia and argues that this is the first epigraphic evidence that a separate Pannonia existed at least since the reign of Nero. However, Šašel-Kos notes that an inscription attests a governor of Illyricum under the reign of Claudius (43-51 AD) and in a military diploma published in the late 1990s, dated July 61 AD, units of auxiliaries from the Pannonian part of the province were mentioned as being stationed in Illyricum. Some other diplomas attest the same. This was during the reign of Nero (51-68 AD). Therefore, Šašel-Kos supports the notion that the province was dissolved during the reign of Vespasian (79-89 AD). In 337, when Constantine the Great died, the Roman Empire was partitioned among his sons. The empire was divided into three praetorian prefectures: the Galliae, Italia, Africa et Illyricum and Oriens. The size of the provinces had been decreased and their number doubled by Diocletian. The provinces were also grouped in dioceses. Dalmatia became one of the seven provinces of the diocese of Pannonia. Initially, it was under the praetorian preacture of Italy, Africa and Illyricum. It seems that the three dioceses of Macedonia, Dacia and Pannonia were first grouped together in a separate praetorian prefecture in 347 by Constans by removing them from the praetorian prefecture of Italy, Africa and Illyricum (which then became the praetorian prefecture of Italy and Africa) or that this praetorian prefecture was formed in 343 when Constans appointed a prefect for Italy. Sirmium, the future capital of the praetorian prefecture of Illyricum, was the birthplace of the Roman Emperor Diocletian. After he abdicated, he built Diocletian's Palace in Salona (modern Split, Croatia). German historian Theodore Mommsen wrote (in his The Provinces of the Roman Empire) that coastal Dalmatia and its islands were fully romanized and Latin-speaking by the 4th century. The Croatian historian Aleksandar Stipčević writes that analysis of archaeological material from that period has shown that the process of romanization was rather selective. While urban centers, both coastal and inland, were almost completely romanized, the situation in the countryside was completely different. Despite the Illyrians being subject to a strong process of acculturation, they continued to speak their native language, worship their own gods and traditions, and follow their own social-political tribal organization which was adapted to Roman administration and political structure only in some necessities. In 454 Marcellinus, a military commander in Dalmatia, rebelled against Valentinian III, the emperor of the west. He seized control of Dalmatia and governed it independently until his death in 468. Julius Nepos became the governor of Dalmatia even though he was a relative of the emperor of the east, Leo I the Thracian, and Dalmatia was under the western part of the Roman empire. Dalmatia remained an autonomous area. In 474 Leo I elevated Nepos as emperor of the western part of the empire in order to depose Glycerius, a usurper emperor. Nepos deposed the usurper, but was in turn deposed in 475 by Orestes, who made his son Romulus Augustus emperor in the west. Leo I refused to recognise him and still held Julius Nepos as the emperor of the west. Romulus Augustus was deposed in 476 by Odoacer, who proclaimed himself king of Italy. Nepos remained in Dalmatia and continued to govern it until he was assassinated in 480. Ovidia, a military commander, was in charge of Dalmatia for a few months. However, Odoacer used Nepos' murder as a pretext to invade Dalmatia, defeated Ovidia and annexed Dalmatia to his kingdom of Italy. In 488 Zeno, the new emperor of the east, sent Theodoric the Great, the king of the Ostrogoths to Italy. Zeno sent him to depose Odoacer. He also wanted to get rid of the Ostrogoths, who were Roman allies and were settled in the eastern part of the empire, but were becoming restless and difficult to manage. Theodoric fought a four-year war in Italy, killed Odoacer, settled his people in Italy and established the Ostrogothic Kingdom there. Dalmatia and the rest of the former diocese of Pannonia came under the Ostrogothic Kingdom. ^ C. Michael Hogan,"Diocletian's Palace", The Megalithic Portal, Andy Burnham ed., 6 October 2007. ^ Theodor Mommsen; William Purdie Dickson; Francis Haverfield (1886). The Provinces of the Roman Empire: From Caesar to Diocletian. Gorgias Press LLC. pp. 203–. ISBN 978-1-59333-025-5. ^ Bury, J. B., History of the Later Roman Empire, p. 408. MacGeorge, P., Late Roman Warlords. Oxford University Press, 2002; ISBN 0-19-925244-0. Wozniak, Frank E. (1981). "East Rome, Ravenna and Western Illyricum: 454-536 A.D." Historia: Zeitschrift für Alte Geschichte. 30 (3): 351–382. This page was last edited on 20 March 2019, at 05:05 (UTC).